At age 78, Schulze brought an impressive career to bear in the Mutual UFO Network’s Special Research Report — released July 10 — on the UFO that surged toward restricted airspace over President Bush’s Crawford ranch seven months ago. In the 1950s, Schulze received a special Army commendation for upgrading missile-tracking antenna sites for the White Sands Proving Grounds. The following decade, he delivered a revelation to America’s intelligence agencies by recording Soviet radar signals bouncing off the lunar surface into receivers on Antigua. Schulze went on to specialize in the radar-return analyses of air traffic accident investigations, and has been called as an expert witness by law firms handling aviation litigation. Schulze, who co-wrote the MUFON report with Robert Powell, wasn’t sure what to expect when he filed his FOIAs with military and civilian agencies in January. What he knew was that, two days after witnesses reported seeing a huge UFO and jet fighters over rural Texas, a spokesman for the 301st Fighter Wing at Carswell Field outside Fort Worth announced there weren’t any warplanes in the area that night. Almost two weeks later, Air Force Maj. Karl Lewis blamed an “internal communications error” for getting it wrong. The public affairs office has been mute on this affair ever since. 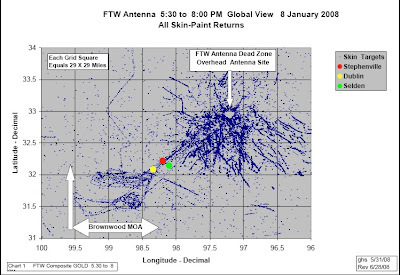 What came as “a fairly mild shock” to Schulze upon reviewing the FOIA data was how primary and secondary radar systems at Fort Worth tracked an aerial intruder — without a transponder — for more than an hour as it made a steady southeasterly course from the Stephenville area toward the Bush ranch. With F-16s thundering about in the general vicinity, the thing apparently slipped below the radar coverage from 7:03 p.m. to 7:10 p.m., accelerated minutes later to 532 mph within a 30-second span, then skidded to 49 mph 10 seconds later. The narrative comes to an abrupt and tantalizing halt at 8 p.m., the end of the 4-8 p.m. data window requested by Schulze’s FOIA. At that moment, the UFO was just 10 miles from Bush’s home, and 4 miles from the edge of the no-fly zone. Well, one ignores an E.T. welcoming committee at one’s own risk.